Time to take a trip back to Hawaii. I'm sure you've heard the phrase "when in Hawaii, do as the Hawaiians do." I'm pretty sure it's that. Anyway, if I'm going to be in Hawaii (at least in my mind) I should drink beverages that I would, but Hawaiian. 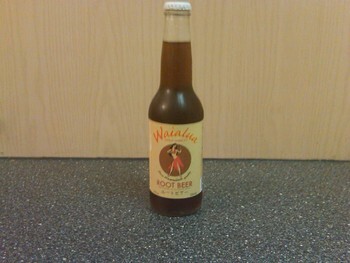 I thought I did a decent job choosing Lilikoi, that's very Hawaiian, but why not see what Hawaiians can do to a mainland drink such as, oh, root beer? It's alright. Like before, I appreciate their ingredients. Cane sugar along with Maui natural white cane sugar. Giving it a variety of sugar is a fantastic idea to me. Along with that some Hawaiian vanilla extract. You can't get a more Hawaiian root beer than this. Sadly it has a bit of a birch beer taste to it. I know that some people can't distinguish between the two, and I guess I can see that, but I'm from Pennsylvania and we know our birch beer! Also it has a little smokey flavor. That may seem ridiculous, but I tasted it on each bottle I had. Very unusual, not in a bad way, and hardly noticable, but interesting and unique when you do notice.